The Empire 3 in. x 1000 ft. caution tape helps prevent accidents by increasing visibility of hazards with non-adhesive barricade tape. Continuous Caution printed warning in black letters. Can be tied stapled or nailed in place. Milwaukee open reel long tapes deliver on best in class accuracy and durability. Both offer nylon bond steel blades that have minimal stretch, and wont kink or tear from abusive conditions. Milwaukee long tapes have industry's first debris wiper, Grime Guard, that prevents dirt, dust and debris from entering the tape, causing jams. Furthermore, reinforced 3:1 metal planetary gears and metal handle guarantees durability in the toughest jobsite conditions. 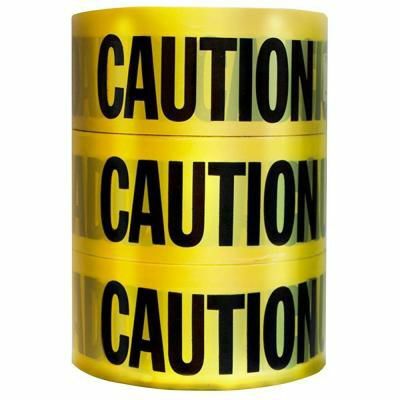 3-Pk Caution Tape The Empire 3 in. x 1000 ft. caution tape helps prevent accidents by increasing visibility of hazards with non-adhesive barricade tape. Continuous Caution printed warning in black letters. Can be tied stapled or nailed in place. 3-Pk Caution Tape is rated 4.0 out of 5 by 22. Rated 5 out of 5 by TR from Thank you, it works fine! ... Thank you, it works fine! Rated 4 out of 5 by Sean from Good for when you have a lot of caution taping... Good for when you have a lot of caution taping to do. Not a good choice for next to walk ways. It is easily torn. Rated 1 out of 5 by Anonymous from no substance or fibers in it , rips apart in... no substance or fibers in it , rips apart in the wind etc .